How do I change the Receipt layout? Click Tools then Print Layouts. In the picklist, choose the layout you want to change - usually Receipt (A4), Receipt (Letter) or Receipt #2 (Paper Roll) and click OK. Make changes to the fonts, logo files, etc. and click Save. For more information, please read the Manual. How do I print a barcode label? Using your regular desktop printer: You will need to have Microsoft Word installed and a suitable barcode font (EVE installs a suitable selection of fonts for you courtesy of IDAutomation.com). You can print multiple labels on a sheet of Avery (or equivalent) labels. See section 4.3.12 of your EVE Help Manual. EVE Also prints labels using a dedicated Zebra barcode label printer, (we recommend Zebra LP2844 or the Zebra TLP2844) or the Zebra GK 420d. Please check with us before buying a printer. Will EVE run on a Mac? I have EVE installed on the same computer as the database and it works fine. However, I cannot connect from a different PC on my network. What am I doing wrong? Click Remote Connections in the Treeview on the left and make sure “Local and remote connections” is selected. Make sure also that “Using both TCP/IP and named pipes” is selected. Open your Firewall program. If you use Windows Firewall on XP, you can do this by opening your Windows Control Panel and then double clicking on the Security Center. Click the Windows Firewall link. If you use Norton Firewall, you can open it by clicking Start then All Programs then Norton Personal Firewall then Norton Personal Firewall. In Windows Firewall, do you can do this as follows: Click on the Exceptions tab and then click Add Program. Click Browse and then go and find the first program. Double click on it or select it and click Open. Click Browse again and repeat for the second program. Click OK twice to save changes and quit the Firewall. In Norton Person Firewall, you can do it as follows: In the Status & Settings section, make sure Person Firewall is selected and click Configure. Click on the Programs tab, click Add and go and find the first program. Double click on it or select it and click Open. Click Add again and repeat for the second program. Click OK to save changes. When EVE starts for the first time after installation, there is a dialog that prompts for company information such as PADI number, etc. After filling in that information, how can you display that dialog again if you want to edit the information entered initially? The form is only shown on startup. The information is written to the Store, Cost Center and Employee records, all of which can be edited in the Data section in EVE. i.e. go to the Data section, click on the Stores: Find button, click Search, double click on the Store record and make changes. Repeat for Cost Centers and Employees. How do I add frequently used items to those bars on the right hand side of the Invoice, Rentals, Services and PO forms? How can we back up to both our internal server, as well as an attached flash drive or external server? Nothing is listed in the manual about backing up, but I like to duplicate my efforts, not just on our current server. I have a firewall installed on my system. How do I set the firewall to allow EVE to run on my network? I need to ask if it possible to run both EVE 4.2 & EVE 5 side by side for at least the next 6+ months. The reason I’m asking is because my boss wants to start from scratch with EVE 5. With my internal Intranet, all of are computers are setup with eve….Now lets say I go home and do some work on eve, when I come back in and link up to the network, will it put all that info I just changed or added into the server? How do I move my database from one computer to another? How do I change the format of the dates that are printed on my receipts? How do I handle the New 2010 VAT Rate in EVE? How do I setup Skype to use with EVE to send Text Messages? 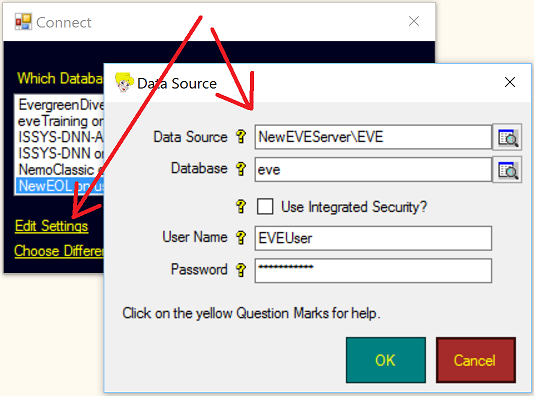 How do I move my EVE database to a different computer? Click here to visit the downloads page and download the latest version of EVE Client and Server. Click here for installation instructions including system requirements. Click here for instructions on how to open up SQL Server so other computers can communicate with it on the network and for information on Firewall settings. 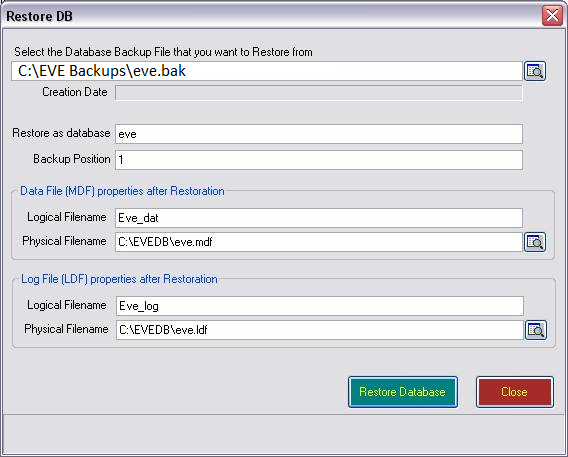 If you don't already have a database backup, click the EVE Globe icon at the top right of EVE and click Backup Now. You can do this in EVE on any computer connected to the old server but, regardless of which computer you use, the backup file will be created on the old server. EVE will tell you the location of the backup file when the backup is complete. It will have a .bak extension and will be called eve.bak or PCName_eve.bak where PCName is the name of your old server computer. But, if you have renamed the database in the past it will have a different name with the .bak extension. Copy your most recent backup file into the folder called C:\EVE Backups on the new server. 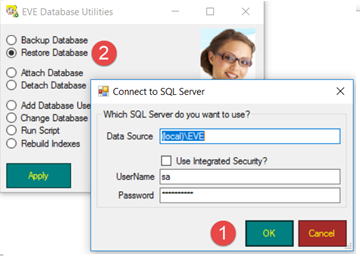 Start the EVE Database Utilities program (it is located in the ISSYS folder on your Start menu and the filename is c:\Program Files (x86)\Integrated Scuba Systems\EVEServer\EVEDBUtils.exe) and click OK on the Connect form. On the Restore DB form, use the values shown in the screenshot below but replace eve.bak with the name of your backup file if different. Click Restore Database. This will cause your database to be restored to the C:\EVEDB folder - i.e. after the restore you should see eve.mdf and eve.ldf in that folder.